Below you will find the latest national and international FASD news, research and upcoming events. If you have some FASD news or upcoming events that you would like us to share with our readers please Contact Us. If you would like to be emailed our monthly newsletter you are able to signup within the footer of every page within this website, or if you would like to read past newsletters via our newsletter archive page, then click the logo or this link. Young people with disabilities may require specialised teaching strategies when learning about puberty, sexuality and relationships. This workshop provides practical information for parents, teachers and workders to help support young people to understand the changes experienced at puberty and to manage this life stage with confidence. Read more. The SECCA App is a free innovative resource to support access to relationships and sexuality education for people of all ages and abilities. Learn more. Lions Clubs District 201W1 (Inc. in WA) proudly presents the 2019 ‘RAZZAMATAZZ’ Comedy & Magic Variety Show. Support families with FASD! Researchers are seeking parents of children aged 4-12, who do not have FASD, to test a new screening tool. By generously giving 40 minutes of your time online you could make a big difference by improving screening for FASD, meaning children could be more easily identified and receive the support that they need. Read more about this study. The Coroner’s Inquest into the deaths of thirteen children and young people in the Kimberley reported that “whilst none had been diagnosed with FASD, the circumstantial evidence would suggest that a number of [these young people] were likely to have been on the spectrum for FASD.” The Coroner made 42 recommendations “aimed at preventing deaths occurring in similar circumstances”, with the first six recommendations being to take action on FASD. Read them here. The ABC recently reported on the growing number of children in informal care arrangements with their grandparents, and the challenges faced by these families. Watch the segment here. Wanslea are seeking grandparent carers to participate in their study to develop a better picture of grandparent mental and physical health, and the services that grandparents would like access to, to help make their carer role easier. Read more and complete the survey here. The Graduate School of Health at University of Technology Sydney is inviting parents whose children have an intellectual or developmental disability to participate in a brief online mindfulness treatment for reducing stress. If you are interested, please contact raphaella.osborn@student.uts.edu.au for more information or view the flyer here. A PhD candidate at UniSA requests research participants for his study into improving screening for young children with Fetal Alcohol Spectrum Disorder. He invites parents and carers raising children between the ages of 4 and 12 years old to take part in a research project aiming to enhance the screening of young children suspected of having FASD. The online survey is anticipated to take approximately 40 minutes to complete, and upon completion all participants will have the opportunity to enter a raffle to win one of eight $50 gift cards. Click here to download the information flyer and to participate. The FASD Hub Australia has published a selection of video recordings from the recent FASD conference in Perth. These include a highlights video and many full presentations which can be accessed here. Included in these is a recording of the parent/carer panel, hosted by NOFASD Australia, in which parents and carers share their experience of caring for young people with FASD. The full video can be viewed here. Sue Miers nominated for Imact 25 Awards! NOFASD’s founder Sue Miers has been nominated for the Pro Bono Australia Impact 25 Awards. Awards will be given based on public votes, with 337 nominees in the running. Sue is recognized for her contribution to raising awareness of FASD in Australia, leading to more research and support services for families and more prevention messaging about the risks of alcohol and pregnancy. Please help us to further raise awareness of FASD by voting for Sue through this link. This advanced level conference/meeting continues to bring together global experts from multiple disciplines to share international research. From the pure science, to prevention, diagnosis and intervention across the lifespan, the conference will address the implications of this research and promote scientific/community collaboration. General Movements Assessments may enable early detection of infants at risk of Cerebral Palsy, Autism Spectrum Disorder and Fetal Alcohol Spectrum Disorder (FASD). Evidence shows that qualitative assessment of General Movements at a very early age is the best predictor for cerebral palsy and can be used as a risk assessment for other neurological conditions. The Australasian FASD Conference co-chairs presented NOFASD founder Sue Miers with a lifetime achievement award in recognition of her contributions to the FASD field. Sue Miers founded NOFASD Australia 20 years ago and has dedicated huge amounts of time and energy to advocacy, prevention and support for families with FASD. Professors Carol Bower and Elizabeth Elliott announced that the award will be named the Sue Miers Award from this day forward in recognition of Sue’s efforts as a pioneer in the FASD field. International FASD specialist Nate Sheets is offering 50% off his 2019 web series at Oregon Behavior Consultation. This 12-part series covers a range of topics on supporting those with FASD. Nate’s webinar series earlier this year received great reviews from NOFASD Australia’s network of parents, carers and professionals. Read more about Nate’s 2019 web series here. Sue founded NOFASD Australia 20 years ago to support the thousands of families struggling to understand and manage FASD. Following her difficulties with finding understanding, diagnosis and support with raising her adopted daughter, Sue wished to reach out to make things easier for other families raising a child with FASD. With Sue’s continued support, NOFASD Australia has flourished into the leading provider of information, services, linkages and referrals for FASD in Australia. Read more here. The 2nd Australasian FASD Conference will be held in Perth on 21-22 November 2018. The conference has the theme Our Science Our Stories and aims to include academics, health professionals, educators, lawyers, politicians, parents & carers, those who support parents & carers and individuals who have FASD. Topics include prevention, screening & diagnosis, epigenetics, education, justice, parent & carer support, management strategies, life-span issues, mental health and economics. View the program here. Australian parents and carers are invited to take part in an online survey to test a new screening tool for children with FASD. Families raising children with and without FASD are asked to participate. Your input will contribute to ensuring that the screening tool is accurate. Click here to access the survey. The Australian Paediatric Surveillance Unit (APSU) is working to collect information about the diagnostic challenges, personal, social and financial needs, as well as family experiences of living with and caring for a child with FASD. This survey is the first of its kind in Australia. Parents and carers are invited to complete the survey, which is estimated to take 30 to 50 minutes. Click here to access the survey. The Truth and Reconciliation Commission of Canada’s (TRC) Call to Action 34 calls on national, provincial and territorial governments to make changes to the criminal justice system to improve outcomes for offenders with Fetal Alcohol Spectrum Disorder (FASD). The 6th National Brain Injury Conference will be held on November 13th and 14th, 2018 at the Princess Alexandra Hospital in Brisbane. Researchers at Griffith University and The University of Queensland are doing a study to explore the impact of fetal alcohol spectrum disorder (FASD) training and professional development on the current practices of Australian and New Zealand health practitioners. View the flyer here or go directly to the survey. A Canadian expert in the field of Forensic Psychiatry and FASD will explore what lawyers need to know when working with a client who may have FASD. Click here for more information and to register. NOFASD Australia are excited to announce that their founder Sue Miers is a finalist in the 2018 HESTA Community Sector Awards! Sue is one of two finalists in the Unsung Hero category and has been recognised for her voluntary work supporting families struggling to manage and understand Fetal Alcohol Spectrum Disorder and for her tireless efforts in increasing awareness and prevention of the disability. The winners of each category will be announced at a special awards dinner in Sydney on October 29th. 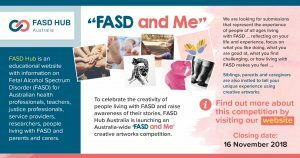 FASD Hub Australia launched a creative artworks competition entitled ‘FASD and Me’ . The competition is open to people of all ages – kids, teenagers, adults living with FASD and their siblings, parents and caregivers. Entries can be drawings, paintings, cartoons, videos, poetry – anyway you want to tell a story. Apparent consumption of alcohol per person has dropped to levels not seen since the 1960s, according to data released by the Australian Bureau of Statistics. community action to raise awareness and reduce the hardship associated with FASD on the Sunshine Coast. The Community Forum will be held on 3 September in Bokarina from 8am to 2.30. Follow this link for more information about the forum and the scheduled presenters. Register for this free event here. Fetal Alcohol Spectrum Disorder is a particularly challenging issue in education. FASD is not easily identified and often goes undiagnosed. Behaviours associated with the disorder, such as learning and behavioural difficulties, can often be associated with and attributed to other disorders. FASD information session is being held on the September 10 at FamilyCare Shepparton for parents, carers and service providers. Train it Forward FASD Masterclass is being held on the September 11 at FamilyCare Shepparton for parents, carers and service providers. Train it Forward FASD Masterclass is being held on the September 12 at the Wallen Family & Children’s Centre Wallen for parents, carers and service providers. Carers and health professionals are invited to participate in a focus group on July 26 at 1:30 pm in Woolloomooloo which will seek feedback on the impact of the implementation of the NDIS on mental health carers and services. Mental Health Carers NSW is currently writing a submission for the parliamentary inquiry into the implementation of the NDIS and the provision of disability services in NSW. The afternoon will start with a joint discussion with both carers and professionals. Following this carers and professionals will split into separate groups in order to ensure that all have an opportunity to talk about the issues that are most pertinent to their situation. Please contact peta.smit-colbran@mentalhealthcarersnsw.org for further information or to RSVP to attend. Donna Ah Chee, a highly respected advocate in the Aboriginal health sector, will be a keynote speaker at this year’s Rural Medicine Australia 2018 (RMA18) conference. The conference will be held at the Darwin Convention Centre from 25 – 27 October 2018, with a pre-conference clinical workshop and meeting day on Wednesday 24 October. RMA18 is the premier annual event for rural and remote doctors. Donna is a Bundgalung woman from the far north coast of New South Wales, and has lived in Alice Springs for 30 years, where she is a leader in the delivery of Aboriginal health services. RDAA President, Dr Adam Coltzau, said: “We are very excited to have Donna — who is such an influential member of the Aboriginal health community — speaking at RMA18. Read more here. Drink Tank recently published an article by NOFASD Australia’s Louise Gray, titled Alcohol and pregnancy – Why doesn’t it worry us? This was written in response to the upcoming government decision on alcohol and pregnancy labelling laws. Australian alcohol companies are not currently required to include pregnancy warning labels on their products, and the Foundation for Alcohol Research and Education (FARE) has commenced campaigning for a new mandatory labelling system to complement its FRSC submission. Read the article here. The Foundation for Alcohol Research and Education (FARE) have started a petition calling on the Australian Rugby League Commission to end alcohol advertising in the NRL. Millions of Australian children and families watch the NRL, a sport that is saturated with advertising. Evidence shows that exposure to alcohol advertising is associated with young people drinking more and from an earlier age. In addition to alcohol contributing to the three leading causes of death among young people in Australia, alcohol also contributes to unplanned pregnancy. Fetal exposure to alcohol causes FASD – the leading known non-genetic cause of developmental disability in children. You can sign the petition here. SA FASD Special Interest/Support Group Meeting – we would love to see you there! The purpose of this informal group is to provide everyone with the opportunity to share your story if you feel comfortable doing so and find understanding and support through group discussion and access to helpful resources. After the success of the last FASD Training Day, the CICADA Centre NSW will host “Demystifying FASD in Youth” to empower GPs, paediatricians, psychiatrists, allied and mental health professionals to develop knowledge and skills in FASD in children and adolescents. The registration form is available here. Join clinical neuropsychologist Associate Professor Carmela Pestell as she sheds light on the hidden epidemic of FASD, why an accurate diagnosis of this complex condition is vital and how sufferers – both children and adults – can be helped to have a better future. Are you the carer of a child with FASD? Are you the carer of a child with FASD? If so, researchers at the University of Queensland Child Health Research Centre are doing a study to assess health and well-being of children with fetal alcohol spectrum disorder (FASD). They are looking to gather information from Australian caregivers who have children with FASD (aged 5-18 years). The study hopes to fill in the gaps and learn more about how Australian children have been impacted by prenatal alcohol exposure and the stressors that caregivers and families are facing. Ultimately this will help to develop interventions to improve the health and well-being of individuals with FASD and their families. It is important that families living with FASD know this conference is designed to benefit those with FASD, those with lived experienced, family support services, clinical professionals and researchers. If you are interested in FASD – there is something for you at this conference! Traditional conference abstract lodgement has been called for, however there is also scope to submit ideas and information in non-traditional ways. This could take the form of photos, videos, stories, posters and other ideas. For example, you may care for a child with a talent for photography and a gallery of photos could provide insight and illumination into the world of that child. Such displays gives others a unique perspective and understanding. You may have designed, or come across, strategies, posters, charts, or tips which may be useful for others. This is the forum to share these ideas and many others, click here to submit fasdconference.com/abstract-submission/. Closing date for submissions is the 11th of May 2018. The Gold Coast Clinic is opening a new clinic for young children aimed at diagnosing children from 3-7 years of age. They are operating this with their usual team and also help from Griffith University. The referral criteria are the same – a history of prenatal alcohol exposure plus developmental or behavioural concerns. Referrals can go through Tanya on CDSGoldCoast@health.qld.gov.au or by phone on 56879183. We’ve put together some information on accessing the NDIS. Read it here. Better Life Centre provides services to assist in the diagnosis and support of people with Fetal Alcohol Spectrum Disorders (FASD). Using a team which may consist of a Paediatrician, Clinical, Educational and Developmental psychologists and Neuropsychologists our allied health professionals help to make the diagnosis process as simple as possible. Adherence to Australian Guidelines, our team upholds national standards in health care. The practitioners help with both child and adult diagnosis, while providing the framework for future support. In the absence of facial dysmorphology, FASD is commonly underdiagnosed and mis-diagnosed as Autism Spectrum Disorder, Attention Deficit Hyperactivity Disorder and Conduct Disorder (Stevens, S., Nash, Koren, & Rove, 2013). Only 41% of allied health and medical professionals are confident in asking about alcohol use during pregnancy which contributes to the under-diagnosis of FASD (Payne, Elliott, Bower et al., 2005). FASD is recognised as the leading preventable cause of birth defects and developmental and learning disability worldwide (Mather, Wiles & O’Brien, 2015). The ‘spectrum’ of birth defects is due to the quantity of alcohol consumed, how frequently it was consumed and the timing during the gestation of the pregnancy it was consumed (May & Gossage, 2011). Rates of alcohol use, binge drinking and drinking during pregnancy are increasing in young Australian women (Elliott, Payne, Morris, Haan & Bower, 2008). The 3 sentinel facial features for FASD (thin upper lip, smooth philtrum, short palpebral fissure length) are specific to alcohol exposure and do not vary by race, age or gender (Moore et al., 2007). Women have articulated that peer pressure & not wanting others to know they are pregnant, insufficient education and the enjoyment of alcohol as reasons they felt giving up alcohol during pregnancy would be hard (Tsang & Elliott, 2017). Life expectancy at birth for people with FAS is 34 years old with the leading cause of death being suicide (Thank & Jonsson, 2016). FASD occurs in all cross-sections of society, wherever there is alcohol there is FASD (Fitzpatrick & Pestell, 2016). High socio-economic status is a strong predictor for alcohol use (McCormack, Hutchinson, Burns, Wilson, Elliott, Allsop, Najman, Jacobs, Rossen, Olsson & Mattick, 2017). Global prevalence is conservatively estimated at 7.7 per 1000 population (95% CI, 4.9-11.7 per 1000 population) and is much higher in populations with risky levels of drinking (Lange, Probst, Gmel, Rehm, Burd & Popova, 2017). Without intervention individuals living with FASD risk developing secondary issues such as school failure, addictions, mental health disorders, dependent living, unemployment, homelessness & incarceration (Popova et al., 2016). NOFASD Australia and the Ministry of Vulnerable Children Oranga Tamariki of New Zealand invite you to a FASD Eyebites Cards Webinar. This informal conversational webinar with Rose Hawkins and Anne Heath will showcase the FASD Eyebites Cards, a fantastic resource for practitioner, parents or carers working with those who have lived experience of FASD. These unique cards can assist as an everyday tool to support families and service providers in key FASD-informed principles. They are also useful in times of challenge. In New Zealand – via email request for Rose.Hawkins@mvcot.govt.nz A small charge may apply. In Australia – via email request to NOFASD’s online enquires form at www.nofasdaustralia.com/contact-us Only postage and handling fees will be charged. Rose Hawkins is the regional disability advisor for the northernmost region of the New Zealand child protection and youth justice organisation, Ministry of Vulnerable Children Oranga Tamariki. Rose realised that much of her work is about support for children, young people and families grappling with the lifelong effects of Fetal Alcohol Spectrum Disorder (FASD). To address this and raise awareness Rose has collaborated with Alcohol Healthwatch and the FASD Centre Aotearoa and developed FASD resources which are “easily digestible” including the FASD Eyebite Cards. Rose’s health and disability career started in physiotherapy, working in diverse clinical areas and management positions across the sector. Dr Anne Heath has a background in community services (alcohol and drug, youth work, disability, mental health, homelessness). Anne recognised that hidden FASD often underpins many challenges across the community sector and has since contributed to awareness raising and community education across Australia. Anne currently works as the national educator at NOFASD Australia and as a Lecturer at the University of Tasmania. Charge: No charge to attend webinar. This FASD (Fetal Alcohol Spectrum Disorder) Forum will bring together specialists to share their knowledge and experience of FASD in the Hunter region. It will also be a professional development and awareness raising opportunity for health professionals, educators, service providers, government agencies and community members who are actively encouraged to attend. DDWA is increasingly being asked to provide advocacy support to people with disability in the area of education and in particular for people experiencing challenging behaviour. We are interested to hear about you or your family member’s experience at school. The survey is for families with a child aged 5-18 with challenging behaviour and difficulties in the school system. If you have more than one child with challenging behaviours, please complete a survey for each child. This survey should take around 10 minutes – a $50 Coles Myer voucher will be sent to a randomly selected respondent. All responses will be treated with confidentiality and we do not share any personal details with third parties. All responses will be de-identified before any findings are reported on. On 24 November 2017 Australian and New Zealand Ministers with responsibility for food regulation, known as the Forum on Food Regulation (the forum), will be considering alcohol pregnancy warning labels. We seek your support by writing to the Health and Food Ministers in your state or territory to ask them to immediately commence the process of mandating proper pregnancy warning labels on all alcohol products. There is a real prospect that Forum members are prepared to end the alcohol industry’s failed and grossly inadequate voluntary consumer information scheme. In 2011, Ministers agreed that alcohol warning labels should be pursued, but allowed the alcohol industry a two year trial period “…to introduce appropriate labelling.”[i] This timeframe was extended in 2014 for another two years. Recent testing (2016) found that the DrinkWise label (‘It is safest not to drink while pregnant’) was misinterpreted by consumers with 38 per cent of those surveyed believing it meant that it was okay to consume alcohol during pregnancy. Alcohol health warning labels promote health messages in ways that other health initiatives do not, at point of sale and at point of consumption. There is a clear regulatory process for food labelling (alcohol is considered a food in this instance) in Australia and New Zealand, this is through Food Standards Australia New Zealand (FSANZ). A labelling standard has not yet been produced, one details the size, location and wording of the label. FSANZ is the only organisation that can do this and needs to be tasked by the Forum to commence the process to implement mandatory alcohol health warning labels. Continued delay and the continued allowance of labels that confuse or are misinterpreted by consumers is dangerous to the health and lives of future generations. TEXT HIGHLIGHTED IN YELLOW ARE PROVIDED AS A GUIDE. PLEASE DELETE BEFORE SUBMITTING. I/we am/are writing about the meeting taking place on 24 November 2017 between Australian and New Zealand Ministers with responsibility for food regulation, known as the Forum on Food Regulation (Forum). I/we ask Forum members to immediately commence the process of mandating proper pregnancy warning labels on all alcohol products. In 2011 the Forum agreed that alcohol warning labels should be pursued, but allowed the alcohol industry a two year trial period “…to introduce appropriate labelling.”[i] This timeframe was extended in 2014 for another two years. The alcohol industry’s voluntary trial has clearly failed. Testing of the DrinkWise label (‘It is safest not to drink while pregnant’) in 2016 found that the label was misinterpreted by consumers with 38 per cent of those surveyed believing it meant that it was okay to consume alcohol during pregnancy. [1This is highly dangerous; alcohol is not like other products, it is associated with considerable harm, particularly when consumed during pregnancy. Consumers have a right to be informed about these dangers. It is time the Ministerial Forum tasked Food Standards Australia and New Zealand to immediately develop a regulatory standard for alcohol product labelling. This includes the standard of wording, consumer testing and application of labels including the size, colour and placement on products. Further delays will result in more babies being born who have been exposed to alcohol in-utero, many of whom will have Fetal Alcohol Spectrum Disorder (FASD). OR DELETE THE SECTION HIGHLIGHTED IN YELLOW IF YOU WOULD LIKE IT TO BE A GENERIC SUPPORT LETTER. WWhen writing to your Minister/s please copy and paste the entire address block and use the salutation provided. 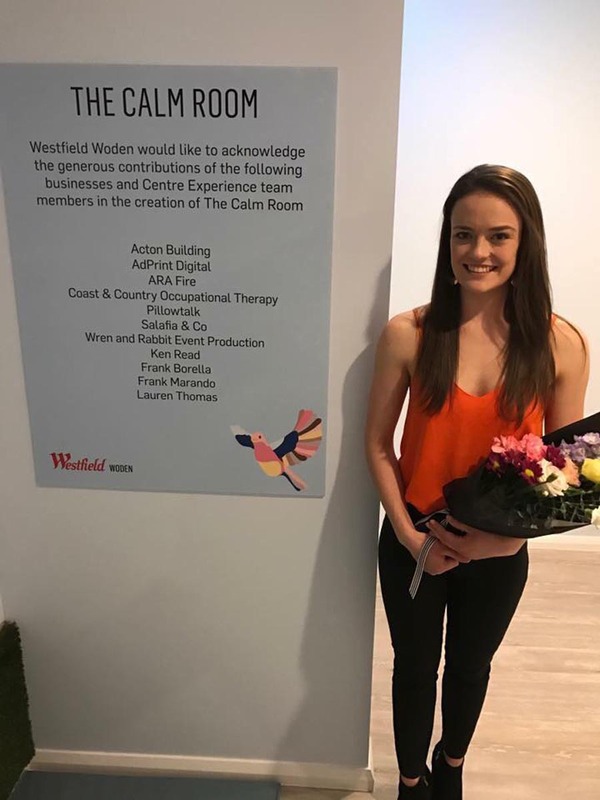 Jessica Hannan, from NOFASD was the OT clinical consultant at the launch of the Calm Room at Westfield Woden (ACT). Designed to be a safe place for individuals living with sensory processing difficulties to go to when they are shopping. Many families reporting that the overloading sensory environment of a shopping centre can impact on parents, carers and families ability to complete this activity of daily living. Westfield Woden decided to give them some independence back. It is designed to be used for individuals of all ages who find the shopping environment difficult to manage. Sensory processing difficulties don’t just occur with Autism Spectrum Disorder but are also a co-morbidity of many other disorders such as ADHD, FASD, trauma, anxiety and PTSD. Are you a service provider, a person living with a mental health condition, or their family or carer with questions about the NDIS? Are you unsure about how it will affect people accessing mental health services? With the NDIS being rolled-out state-wide, now is a great time to learn more about how it may affect you. This course will help you maximise the potential of the Scheme to support people to live the life they want. Brain Injury Australia thought you might be interested in two workshops on “getting the best” out of the NDIS that we are offering in November.